Enjoy Iron Arm Technique training video in Kung Fu Republic. In the ancient, Mandarin Duck Rings (Yuan Yang Huan) were primarily used as hidden projectile weapons and training apparatus. In addition, it was used as a tool for communication too. Carried by scouts in the past, they hung the Yuan Yang Huan on the both side of saddle to their horse. Their duty was to explore the situation a few kilometers in ahead of the mercenary with goods or people. Once they detected any activity, they would wear these Yuan Yang Huan on their arms, and produce metal colliding sound by shaking their arms. These sounds could be heard as far as 3 kilometers away, and the mercenary would be alerted on the situation ahead. Serving as hidden projectile weapons, this can be treated as one of the weapons training. However, at the more recent days, it is more often to be used as a training apparatus. 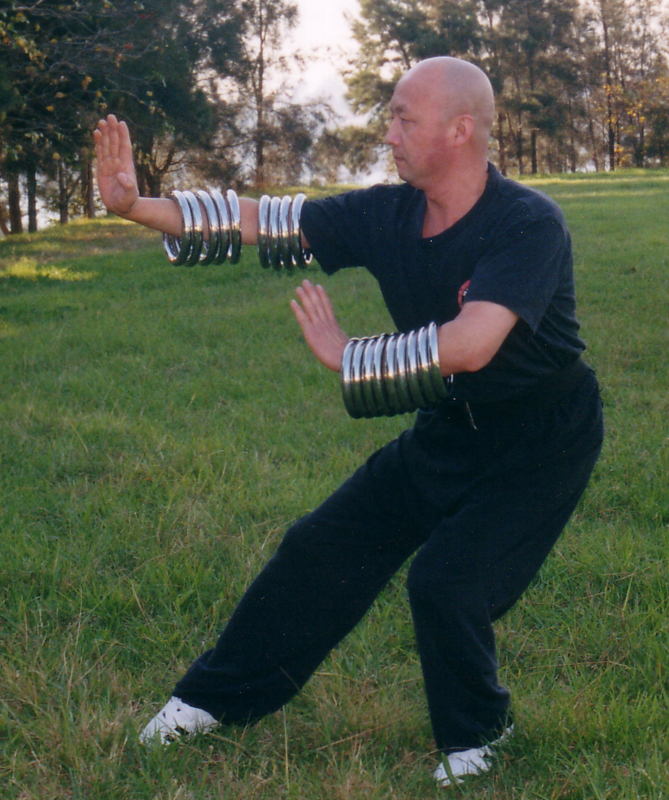 After training with Yuan Yang Huan for some long period, the practitioner’s arms become incredibly strong. Imagine your arms are turning into a pair of iron clubs. Nowadays, Mandarin Duck Rings training is a complementary training for Qin Na as well as Qi Gong training. It helps in the training of various skills of hands, as well as basic techniques of Qin Na, which consists of controlling and restraining techniques. It can also facilitate Qi Gong training by increasing Qi within the body. Its training also includes individual technique practice and Tao Lu practise, which is a preset interlinked sequence of forms. At first, this training can be very arduous for the beginners. Through about a month of intensive training, the physical strength of the practitioners will increase by folds, and his constitution will be significantly increased. After long period of training, his arms become incredibly strong, while his skin turns smoother, more radiant and full of elasticity. Accomplished Iron Arms training practitioners will often find muscles with the size of chestnut appearing on both arms, upon clenching of fists and flexing of arms. This is known as the “chestnut fresh”. During combat, fighting with the hard irony arms, the opponent will feel like hitting to the iron clubs as they strike the practitioner’s iron arms. The opponent is very unlikely to withstand a heavy strike of the iron arm. This makes the Iron Arms training an excellent skill for physical conditioning as well as self-defense. Furthermore, the Iron Arms technique can be complemented with all-around Hanging Basket Skills (“Diao Kuang Shu“) and Iron Palm Skills (“Tie Sha Zhang“). The practitioner is able to deal with multiple opponents simultaneously without fear. Interested in learning Iron Arms in Sydney? Email to us and reserve your slot now.